Jan. 3 (UPI) — Scientists and the models they build have underestimated the amount of methane seeping from beneath the Greenland Ice Sheet and into the atmosphere, according to new research. Last summer, for three months, an international team of scientists monitored the levels of methane being released into the atmosphere by glacial meltwater draining from a 230 square-mile portion of the Greenland Ice Sheet. During their stay, scientists determined the icy catchment’s meltwater released at least six tons of methane. Like CO2, methane is a greenhouse gas, meaning its presence in the atmosphere amplifies the warming effect of the sun’s rays. Though less abundant than CO2, methane’s greenhouse effect is significantly greater. 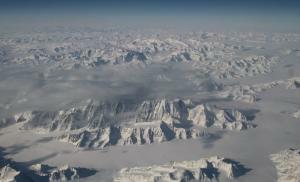 “A key finding is that much of the methane produced beneath the ice likely escapes the Greenland Ice Sheet in large, fast flowing rivers before it can be oxidized to CO2, a typical fate for methane gas which normally reduces its greenhouse warming potency,” lead researcher Jemma Wadham, director of the Cabot Institute for the Environment at the University of Bristol, said in a news release. Scientists knew the Greenland Ice Sheet contained methane — the gas has previously been found trapped in ice cores and subglacial lakes. But the new research, published in the journal Nature, marks the first time scientists have precisely measured methane output during the spring and summer months, when Greenland’s glaciers melt more rapidly. Researchers think a wealth of microbial activity beneath the ice sheet are responsible for the proliferating methane’s production. “This subglacial methane is essentially a biomarker for life in these isolated habitats,” Lamarche-Gagnon said.